Selling a house is one of the most stressful events in life. In fact, one poll says buying a home is more stressful than bankruptcy, divorce and even the loss of someone you love. With the housing market finally recovering, many people are looking to sell their home and either upgrade or downgrade, depending on their specific situation. Whether you’re a young, single businessman, an elder couple or a couple with kids, selling a home is going to be stressful. Before listing your house, use these tips so you can minimize stress when selling your home. When you move, you’re most likely going to have to get rid of a few things. Take care of this before listing your house to make your life easier when selling. The less “stuff” you have, the less you have to clean and put away before house showings. Plus, when you do eventually sell your home and move, you’ll spend much less time decluttering and sorting through old, miscellaneous items. Showings can happen quickly. You might be at the grocery store on a Tuesday afternoon and get a call from your realtor that you have a showing in one hour. If your house is always 10 minutes away from being clean, you can handle showings on short-notice. Keep up with the dishes and laundry, vacuum the floors weekly and deep clean the bathrooms bi-weekly. The cleaner you keep your home, the less stressed out you’ll be with spur-of-the-moment showings. Weekends—especially the first two weekends your house is on the market—are typically when your house is going to get the most action. Instead of trying to live like you normally would on a weekend, plan a day trip or an all-day activity, such as a visit to the zoo or a day out with friends. It’s hard not to get ahead of yourself and hope you sell your house within a day of it being listed. While your home might sell immediately, there’s also the chance it will sit on the market for a few months or even a year. 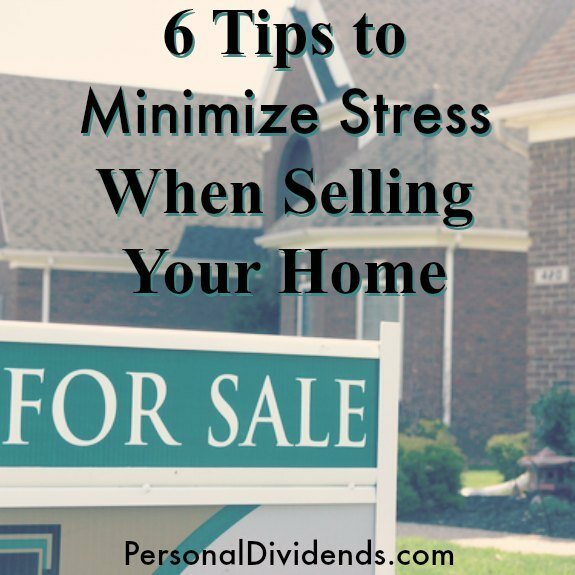 By not being in a rush to sell your home, you’ll automatically lower your stress levels. This is not an option for everyone, but if you can move out before listing your home, you’ll experience less stress on a day-to-day basis. Your house will always be ready to show without you having to lift a finger. Of course, until it sells you’ll be responsible for the mortgage payment on that home and on your new one, so make sure you’re financially able to make both payments for as long as it takes to sell your home. If you have children, selling a house can be especially stressful. One great way to minimize stress is to accept that fact that most likely, your home will never be “perfectly” clean for showings. Luckily, most potential buyers will be understanding and can look past a little mess here and there. Have you ever sold a home? What are your tips for reducing stress?